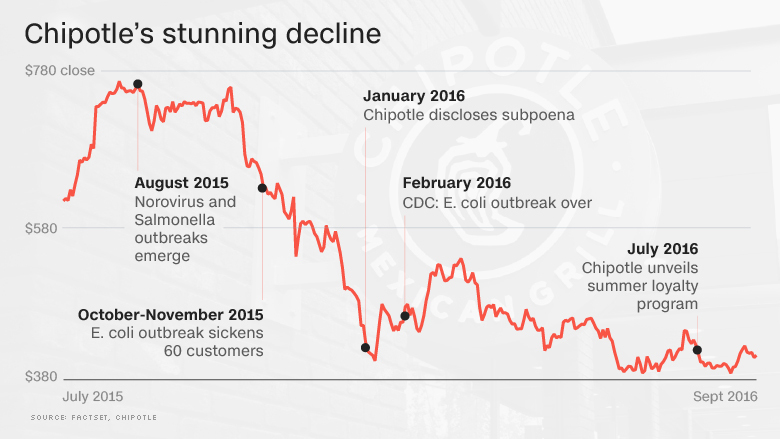 The food safety crisis at Chipotle has wiped out an incredible $11 billion of the company's market value. Some fear that may just be the tip of the iceberg. His dire prediction stems from a combination of factors ranging from the criminal investigation into Chipotle's handling of the crisis, allegations of wage theft from its workers, and a lack of confidence in the company's management. He says that the overly-optimistic expectations for a sales rebound has also kept the stock from falling further. "Management doesn't know what they're doing" and has "displayed immense hubris," Penney, an analyst at Hedgeye Risk Management, said during a conference call with clients. "The only thing they know how to do is give food away. That's never, ever worked in the food industry." Chipotle responded by telling CNNMoney a "significant majority of our shareholders don't agree with Mr. Penney." Chris Arnold, a company spokesman, pointed to how both of Chipotle's co-CEOs, including founder Steve Ells, were reelected and received more than 95% of the shareholders' votes. Chipotle also cited improving sales metrics, saying that by the end of the second quarter the restaurant had recovered nearly 40% of lost sales. "This takes some time, but things are moving in the right direction," Arnold said. He pointed to how Extra Strength Tylenol eventually recovered from a health scare of its own. The painkiller suffered a dramatic decline in market share after a deadly tampering scandal in the early 1980s, but sales almost fully recovered a year later. Chipotle's problems began last August, when an outbreak of norovirus sickened 243 people at a restaurant in Simi Valley, Ca. In the weeks and months that followed, outbreaks of salmonella and E. coli were detected in various parts of the U.S. The food safety concerns caused a plunge in sales that led to Chipotle's first-ever quarterly loss as a public company. Chipotle's stock has already dropped by 45% from a record high in early August to around $414 today. 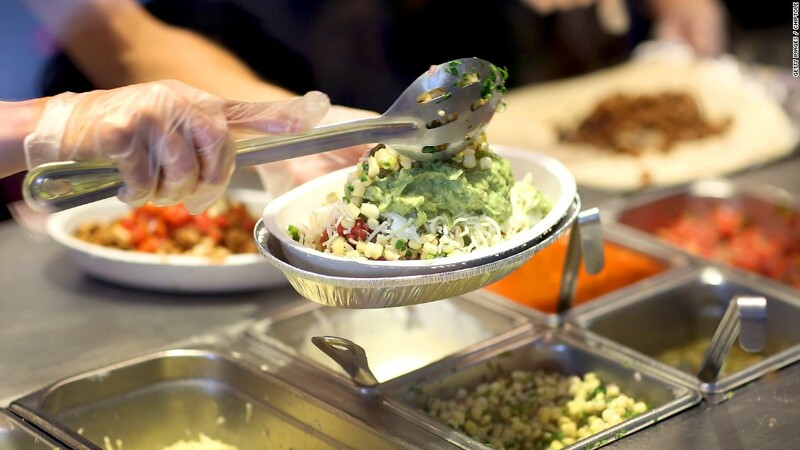 Wall Street remains skeptical about a possible Chipotle comeback. Just one-third of notoriously-optimistic analysts who cover the company have a "buy" rating on the stock. Penney, who has been bearish since October 2015, said his base-case scenario calls for the stock to drop 45% to $227. In a worst-case scenario, Chipotle could drop as much as 60% to $166 a share, he said. "It's been an extraordinary destruction in value for this company that I've never seen before," said Penney, who doesn't own any Chipotle stock, nor has he or his firm bet against it. Penney called Chipotle's "Chiptopia" rewards program that offers free food after qualifying visits a "joke." The other problem is that Chipotle must engineer a comeback in an environment where restaurants of all stripes are struggling. Penney and others have called for a "restaurant recession" caused by cautious consumer spending, too many restaurants and sticker shock prompted by higher menu prices. Chipotle is also grappling with serious legal headaches. As CNNMoney first reported, nearly 10,000 current and former workers are suing Chipotle for alleged wage theft. Penney said it's "incredible" to think that the equivalent of 20% of the current workforce is suing Chipotle. "In the hospitality business, this is the kiss of death," he said. Even more concerning, Chipotle is facing a rare criminal investigation from the FDA's Office of Criminal Investigations. Hedgeye's research found just four other examples of public companies in the past decade disclosing a criminal investigation from the FDA. "The longer this drags out for Chipotle, the worse it's going to get," he said.